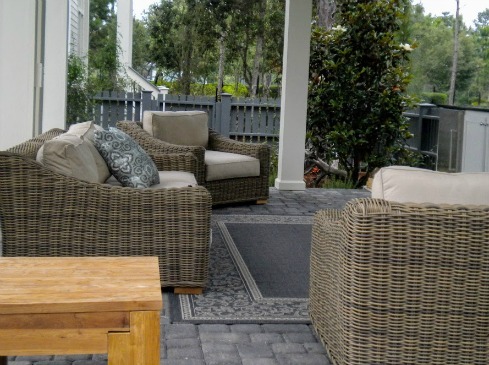 We love our wicker patio furniture set and wonder how we got along without it. Sitting by the pool has never been so comfortable. The curved set of 3 love seats makes for enjoyable conversations. With a busy summer of hosting a reunion and a wedding brunch we wanted to add more seating around the pool. After getting sticker shock for outdoor seating sets at our local furniture stores, I checked out Amazon. 1. 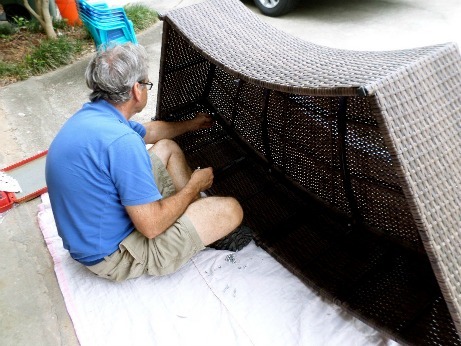 The outdoor resin wicker is a nice dark brown finish and looks great. 2. Two coffee tables that fit on the ends or between the curved seats means ample places to put down a drink or plate of food. 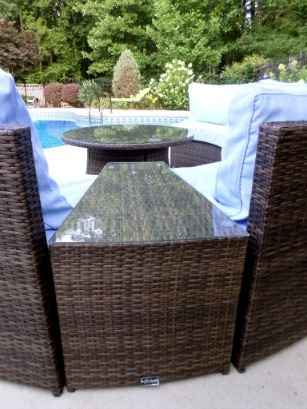 Another round wicker table with a glass top sits in the middle of the curved love seats. 3. 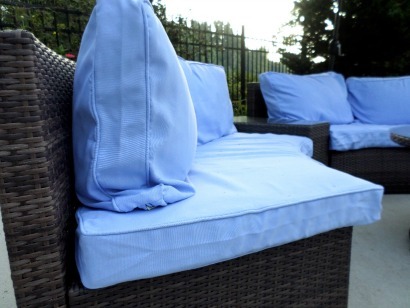 Sunbrella covers for long lasting and stain resistant fabric. 4. The covers can be removed for cleaning or if you want to change the color. 5. Thick cushions for the seat and backrest means the seats are quite comfortable. 6. Because the frames are light weight they can be moved easily. Which means when summer ends we will move them to go around our outdoor fire pit. 7. Durable resin and aluminum frame mean they can stay outside year round and don't need to be stored away in the winter. Be aware that there is some assembly required. The cushions and pieces were delivered quickly and scheduled so that the boxes could be dropped off if we were not at home. The delivery company was very communicative and dropped off the boxes right where we asked them to. The cushions are a neutral tan but then when you purchase the set you pick the removable color cushion covers that you would like. A patio furniture conversation set made of a gray or brown weathered resin wicker provides an updated but timeless look to your outdoor seating. Amazon offers an 8 piece set constructed of powder coated aluminum that includes weatherproof foam cushions that allow moisture to completely drain. The cushions are covered in charcoal gray but more importantly are made from Sunbrella fabric that resists fading, staining and molding. The set includes a sofa, two club chairs, 2 ottomans, a coffee table and a side table"
This patio furniture conversation set includes a couch, two chairs, and an coffee table. The pieces are made of a sturdy steel frame and the table has a removable tempered glass for easy cleaning and for serving drinks and food. A more sleek, modern design and look appeals to all ages and can find a spot in any backyard oasis. 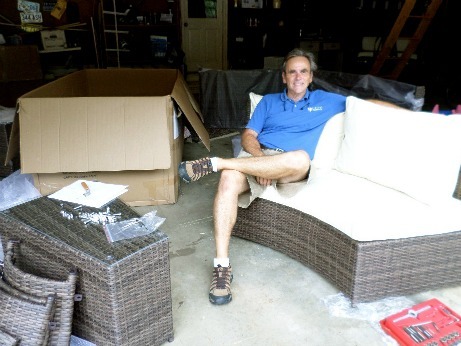 This wicker patio furniture set includes an outdoor sectional with an ottoman and a large coffee table. The reviews all seem to be consistent for this manufacture - great value, nice thick, comfortable cushions, sturdy frame, and attractive resin wicker. The furniture is easy to maintain or move. 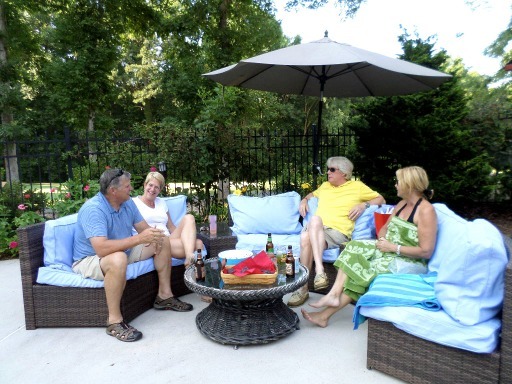 So find the set that best meets the needs of your outdoor space and move your conversations with friends or family to the pool deck.